Bethesda were part of the story. Fallout 3 previews, between explaining VATS and the Megaton dilemma, made sure to note the long-standing concerns over whether Bethesda could pull this off. Bethesda had inserted themselves into the history of someone else's series: Fallout, ardently mythologised as a classic although its commercial cachet had declined. After Bethesda cultivated their house franchise into a well-received cross-platform hit with Oblivion, they suddenly had everything to prove. Their motivations find parallel in the story Fallout 3 tells about the player character's father, James. One day and without any specific impetus, James abruptly leaves home and the security it provides to risk everything on resurrecting a certain project commonly thought to be untenable after some recent failures. Why'd he leave, and why did Bethesda decide to do this? Fortunately they did, because at worst, Fallout 3 would have been an undetermined game; a cautious compromise between the varying design sensibilities of Bethesda and Black Isle and a half-hearted and restrained remake of the original Fallout. That's not Fallout 3. Here's why it mattered to the post-apocalyptic, profanity-laden, morally vague wasteland that Bethesda make it this time. Game worlds which exist in their fiction as monumental achievements -- like Rapture and Liberty City, grand and exhaustive -- can reflect their developers' real-life dedication to building a quality game. Instead of vicariously crafting in-game opulence, Bethesda recreated Washington, D.C. as a blasted shithole devastated by nuclear war and depressingly rendered in decrepit detail. BioShock was a toast to failed ambition; Fallout 3 a toast to failure. Given Fallout 3's timing, reintroducing the series' conceit of war beginning with an Alaskan invasion is faintly hilarious. Now that the resultant wasteland exists in one of Bethesda's open and persistent worlds, you're forced to survey the full extent of the destruction. You can't ignore all the bombed-out highways, the bridges to nowhere, the irradiated waters, the torn-apart schools, the abandoned cars, the skeletal remains embracing on the beds of shattered houses, the random and meaningless firefights and explosions. That's the world, and you have to deal with it even when it has no quest relevance. No previous Fallout game has actually felt so plausibly Post-Nuclear, and if Fallout 3 doesn't seem as funny as its predecessors it's because there's really nothing funny about that. A video game has never been so appropriately painted in brown and gray; the thematic prerogative of Gears of War wasn't hopelessness. 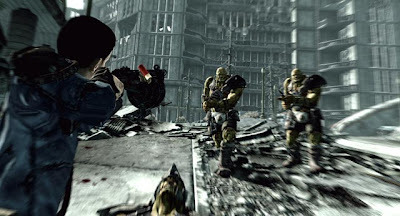 The decision to set Fallout 3 in D.C. was ostensibly made to further distance Bethesda's game from the West Coast adventures of Fallout 1 and 2, and because the Maryland-based developer were more familiar with the Capitol. Workmanlike reasoning which doesn't hint at the massive implications the decision would have on the creative direction of the game. It's not until after the player leaves the pristine sanctity of Vault 101 in search of his father and makes it to Washington proper that you remember what's specifically important about D.C. Not until you march down the Mall, through the wrecks of the Washington Monument, the Capitol Building, the Museums of History and Technology, the National Archives and the Lincoln Memorial to the tune of the America the Beautiful, ducking the street-gangs and mutants further blowing apart the ruins that you can tell this is the dismal coda to American history. America as it was conceived in 1776 is in gradual decline and while some civilians still go about their lives it seems inevitable that the light will blink out sooner rather than later. When you're able to casually scavenge the Declaration of Independence, and sell it, whatever immaculate prestige American history once had is probably gone. On your tour of D.C. you're made to revisit all the initial promise inherent in that document while you're picking up the pieces and kicking around the ashes. The buildings stand remarkably intact, frozen in time, for you to look up at and think about how this all went to hell. Sitting in the Museum of Technology's planetarium, you can watch the stars flicker across the ceiling from an antiquated projector, listening to an earnest narrator explains the great dream of mankind to explore outer space and some '40s nostalgia drifting over the radio. A pair of super mutants interrupt with lead pipes and miniguns, screaming about tearing your head off. That's Fallout 3. It's a heartbreaking picture, even though Fallout is still decorated with contrarily cheerful '50s duck-and-cover iconography, replete with the perpetually enthused Vault Boy character. As much as that imagery serves as ironic commentary, it almost exists to leaven the psychological burden of walking around awake in this nightmare. If you can point to something out-of-place or ridiculous, then you can detach from the world rather than submitting to it as a reasonable state of existence. Even so, Fallout the third is the sober one in the family, and whether you think that's a deliberate choice or Bethesda's Achilles' heel, it works for this game. Fallout 3 executes its humorous interstitials as well as anything in the first game, while rejecting the broader pop culture excesses of Fallout 2's Monty Python prostitute showcase. It is, after all, the end of the world. Far Cry 2, another sequel from a different studio, has absolutely nothing to do with the first game. The name is a vehicle for an unrelated design document and the game's called Far Cry 2 only because Ubisoft doesn't own the Mercenaries license. The new Far Cry team and the new Fallout team offer new perspectives. Far Cry 2's Africa abandons aliens for malaria, item degradation, civil war and all-purpose ugliness while Fallout 3's wasteland is deliberately and unremittingly tragic. To the history of their respective series, they introduce a conscience. They tell gamers that they can have their open-world shooter and post-apocalyptic wastelands, with their bloody conflicts, nuclear weapons, headshots, political intrigue and all the occasionally goofy video game accouterments, but they won't pretend anymore that it's all unreservedly awesome. You should feel bad in Far Cry 2 or sad just walking around in Fallout 3. That Fallout 3 is able to convey all this entirely through atmosphere rather than disadvantaging the player (a page out of the survival horror playbook) is a pretty remarkable achievement. Fallout 3's weirdest moment has two costumed crusaders fighting on the outskirts of a remote town, calling themselves the Mechanist and the AntAgonizer. It's a moronic premise, albeit one right in line with Fallout. When you talk to the AntAgonizer, though, and persuade her to knock it off, the game treats her with completely dignity as she presents a reasonable case for how she wanted to help the impossibly lost inhabitants of the wasteland before running away in tears. As Fallout's setting is such an unnatural mode of existence, it's especially worthwhile to observe how the residents of the wasteland choose to live their lives. What are you supposed to do when all of civilisation's institutions have been erased? 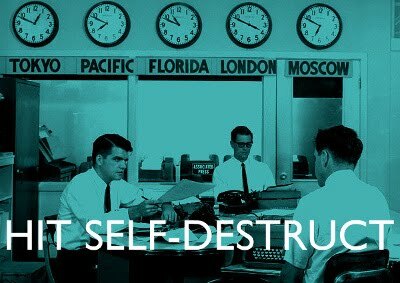 Everyone you meet has written their own self-help book on post-nuclear living. Most subsist on vice, as murderers, dealers, slavers and prostitutes. Skilled fighters hire themselves out as mercenaries or anarchically pillage towns. Others go flat-out insane. Personal survival can be so insurmountable a bar that few rise above self-interest and do what's right for what little remains of the world. Some try, like the semi-righteous order of knights, the Brotherhood of Steel, but even they're divided on how much they want to help out humanity. The Capitol Wasteland lacks any government or ideology and as chaotic and sociologically fractured as it is, it's a perfect setting for an unfocused open-world game. There's exactly one person in Fallout 3 who will sacrifice for the greater good and you can follow him if you want. It's impossible though to believe that in this world enough people like Alexander Hamilton or James Madison will emerge; a small number of smart people who, though ideologically divided, could do something as immense as drafting and ratifying the Constitution. You can't expect any such coherence or drive from the people of Fallout 3. Most interesting among the populace are not the raiders or the samaritans but those going on as if nothing happened. Isolated in private zones or secluded in vaults, they run restaurants, sweep floors, nurse high school crushes; reintroducing domesticity to the post-apocalypse. You have to wonder how responsible that actually is. Are they doing the right thing in rebuilding familiar societal constructs, or should they accept that the world's in decline and do something about it? You're an actor in the wasteland like the rest, with more agency and influence than all of them combined, which prompts you to consider what you are going to do. In Fallout, making moral decisions isn't a feature designed to encourage replayability, it's arguably the entire point. Fallout is distinctly unlike those "choose fate, save world" games like Mass Effect (or Oblivion, for that matter) since their worlds are never believably imperiled. The world is in pretty good shape for the entire game; the danger is theoretical and only ever exacerbated by the player allowing the linear plot to progress. Here, the world is already a write-off. You can't fix the wasteland or the war but there are so many people whose lives you can affect, and that in turn determines what kind of person you are. All that really matters is the quality of your character. If you help whoever you meet you won't get anything out of it, not really, not the world or power or glory or any kind of meaningful relationship. All it is is karma. In a weird way, the wasteland is an inviting avenue for change. There are no rules, no institutions, no laws. What do you do when nobody is watching and you can't be held accountable? If you try and approximate the moral and legal standards of today, then that's a statement in itself: you want those structures to endure. The place is already so desolate you don't even have to do much to improve it. It reminds me, tangentially, of reading about post-invasion Iraq and the early stages of the occupation when the country, bleached to a dreamlike blank slate, so briefly overflowed with possibilities, and an influx of bright young graduates headed out to the Green Zone to reconstruct the country. I remember thinking, for one dangerously unguarded moment, that wouldn't it be great to move to Baghdad. A place where there's so much to achieve and you can finally have an impact even though you'll probably ruin everything and get murdered. When the Ink Spots' shiftless anthem "Maybe" is broadcast over the in-game radio, the song being the first thing you heard in Fallout 1, it invokes the series' own memory. Bethesda inspire nostalgia for something they had nothing to do with and recall how unlikely it once seemed that they'd be the ones to restart this thing. The lyrics -- "Maybe you'll sit and sigh, wishing that I were near/Then maybe you'll ask me to come back again/And maybe I'll say 'Maybe'" -- contradict what this game is all about. Fallout 3 is about making a decision. It's about commitment. It's about doing something. If it seems like an overly general theme consider Bethesda's own history with this game, how, out of unspecified desire, they left the safety of the Elder Scrolls for this, and how many development studios are factories for endless variations on popular franchises or uninspired sequels nobody cares about. Fallout 3 is a tribute to intent. It's not a rallying cry for any cause or even a cautionary tale about the hypothetical horrors of nuclear holocaust. It's a statement on the worthlessness of inaction. It's about not staying in the vault. In the spirit, then, of conclusive action and definitive answers, we are at last able to resolve every question we've ever had about this game. Does it work; did they pull it off; was it worth all the time, the money, the effort, the mistrust and the suspicion; with everything that this game says and everything that it achieves, well, finally, is this Fallout? I feel as though the setting of Fallout 3 has been downplayed. Maybe that's because the majority of reviews I've read have focussed on discussing the VATS system. I forget who said it, but I was reading the work of someone a few days ago who was analysing another song in Fallout 3. They noted how appropriate the selection of "I don't want to set the world on fire" was as a lyric. 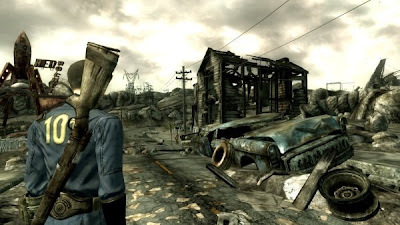 Fallout 3 isn't about playing the inevitable pilgrim. I'm tempted to undermine your work here by demanding you award the game a score. I haven't been able to get my hands on a copy of the game yet, but I just wanted to say that I really enjoyed reading this piece. The quality of your writing here is really, really top notch. 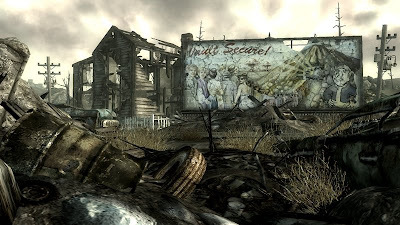 What I absolutely love about Fallout 3 is what you talk about - how depressing the gameworld is. It does make me feel extremely sad, finding empty houses, blasted skeletons, all these scorched little remnants of human life you find all over the place, sometimes coming across a harrowing story from someone who was actually there during the war, or hearing heartbreaking holotapes from children who were there when the world blew up or even just the placards right outside your own Vault 101 saying things like "LET US IN YOU FUCKERS". The consequence of such a harsh realistic depiction of the wasteland is that the bits of comedy that are there, mostly don't really work. The original Fallout games were much more laconic and cartoony - this is what happened, we did it ourselves, let's get on with the story. Same goes for the gory VATS stuff - it feels a bit out of place, in a way (which doesn't mean I didn't pick the Bloody Mess perk as soon as I could, ofcourse). Something else that has impressed me is that the game made me feel how a radiostation like Galaxy would actually make a difference in such a world - whenever I'm trudging through the irradiated wastes, it really helps to lift my mood now and then to switch on Galaxy radio. Good article, lots to agree with. 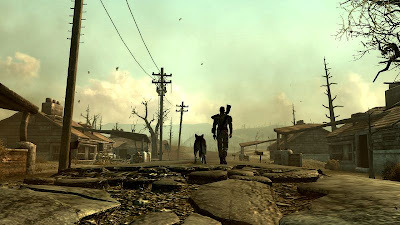 I especially share your faciantion with what makes a post-apocalyptic wasteland such a compelling canvas for a (game) story. It means that every little action become non-trivial. There is no 'saving the world', so saving anyone at all, even just yourself, becomes that much more poignant. qrter: For the most part the comedy of Fallout 3 definitely feels like something Bethesda inherited but I find it pretty non-intrusive. The superhero quest I mentioned was the one time it felt absolutely out of place but even that resolved itself gracefully. Generally Bethesda have been pretty smart about when to use humour. I don't mind the VATS stuff either although I decided pretty early on I wasn't going to need the Bloody Mess perk. Spencer: All the songs are really well chosen, actually. You could probably draw some parallel to the in-game action with most of the songs. Honestly, though, I think it's astonishing. Probably the best game I've played all year. To elaborate on VATS a bit more, I am actually a little torn on it. I like the mechanics fine and I have no problem with the slow motion stuff in and of itself, but it's a stylistic contradiction with the rest of the game. Except for the intro/outro slideshows, Bethesda never wrest control of the camera from you EXCEPT for in VATS where they do it continuously. It honestly doesn't bother me on anything other than a purely theoretical level but I find it a little weird. I don't mind VATS mechanically, I use it a lot, eventhough by now my Small Guns is high enough so that I can pretty much play the game as an FPS (which it's not, ofcourse), but it seems to still yield the best results. I just think that in the older games the combat was cartoony first, then gory, here it's the other way round. The songs in the game are fantastic, some people have been complaining about there not being enough and it getting a bit boring, I don't have that problem myself. Basically I'm just waiting for Bob Crosby's Way back home to come around again..
A lot of good, interesting thoughts here. As to "is it Fallout," I can't imagine how one wold rationalize saying it isn't. Bethesda nailed it so well that now the original game seems like it was always a sketch just waiting to be fully realized by Fallout 3. I wonder though how much of that gore/cartoon balance was stylistic choice and how much was graphical limitation. Fallout 1 did try to compensate its for low fidelity visuals with those descriptions: "CRITICAL HIT: Ian massively punches Raider in his fat head and his brains blow out on the sidewalk in a bloody splatter" or whatever the hell. I feel like they would have gone for Fallout 3-level gore if they could. Even so, I don't think the bleakness of Fallout 3 would be particularly well-served by cartoon violence. Also, how can you quote that song but leave out the most pertinent lyrics: Don't know why I left the homestead/I really must confess/I'm a weary exile/Singing my song of loneliness. I should actually quote the whole thing to do it justice, those are some amazing lyrics, especially in connection to the game ofcourse. You're right, how much of the older Fallout games is a stylistic choice, how much is it what could be done at the time. But then they still made a design choice based on technical limitations - it only makes me wonder more about Bethesda's choice, seeing as they don't have those limitations. Would they've gone for a gory VATS system if it wasn't part of the lauded Fallout-series? I mean, they bought the IP which would mean a resounding "yes", but I mean could they've come up with a different, new system, more suited to their vision of Fallout-America. As to whether it is "really Fallout" seems like a nonrelevant question to me - as long as the game works on its own terms, it's a success. And that it seems to do. And be. Having played for just a few hours now, I already agree with your point about the VATS camera. It's definitely something that feels quite forced and mechanical, whereas the interstitial first-person zooms - for conversations and the like - feel natural and "right" to me. Also the point about gore and humour, as discussed here in comments, makes me think that maybe (sorry) Bethesda have pitched it right with the VATS's effects. Black Isle certainly didn't hold back with their descriptive combat texts in the earlier games, and I agree that they likely would've tried to get closer to realising their descriptions visually if they'd had the resources available to them. Great writing by the way--you've cemented my resolve to play the game more thoroughly now, rather than snack on it here and there as I have been. Great piece! But I can't help but feeling your closing line was more structurally clever than it was an actual fitting end to your piece. You clearly have strong opinions about Fallout 3, and directly contrast and compare it to its predecessors, and you do point out the all-encompassing theme of decision, so wouldn't it be appropriate for you to answer your own question than waffle out of it? Anyway, again, a wonderful read! Fair enough, you have accurately flagged my weakness for a stylistic flourish. I felt that ending by basically saying "yes" or "no" would have been anti-climactic. Because I'd written earlier about the song "Maybe" being so strongly identified with Fallout 1, answering "is it Fallout" with "maybe" was really code for "yes". It was an attempt at subverting the indecision of the song into a somewhat definitive statement. The question of whether it's "really Fallout" or whether it has proved itself worthy of the name is not something that has ever mattered to me. Certainly it had little to no bearing on what I thought about this game. You might suggest then that it was a poorly-chosen question to frame an article around. If the answer "maybe" is unsatisfying or a cop-out, it's at least a little bit on purpose. I'm tired of "is it Fallout? ", I think it's a smokescreen and only has any value as an easy preview/review lede. The last line is facetious and half-hearted because I wanted to deflate the importance of that question. If I'm saying anything in the conclusion, I hope it's that the issues raised in the first and last paragraphs of my article are ultimately irrelevant. It's what people think they're suppoed so be concerned about. The rest of the article is what the game means to me. Is it Fallout? As if the answer to that question is supposed to validate the existence of this game? Even if it isn't, so what? I loved this game and what it was called mattered to me very little. Should Bethesda have called it something else out of respect to Black Isle or whatever? I don't know, and at a point I don't care very much. I agree that the game needs no comparisons to Fallouts 1 and 2 to stand on its own merits, and the constant questions are tiresome, but the last paragraph didn't strongly suggest that sentiment to me, perhaps because of how otherwise straight-laced the preceding article was. Anyway, it's a minor complaint! As to the references to Fallout 1's crit text, many of THOSE were lifted directly from Wasteland, a game which had to rely almost entirely on text to depict combat, and pushed the gory descriptions to comical extremes. The continuum from the fidelity of Wasteland's gory combat to Fallout 3's seems pretty linear.